Our goal at Thubten Kunga Ling is to help students achieve their maximum potential for wisdom, happiness, and compassion. Our programs present Buddhist teachings in an authentic and traditional manner, without compromising their integrity. At the same time, we attempt to adapt the presentation of these teachings to modern mentalities, sensibilities, and situations. We are affiliated with the Foundation for the Preservation of the Mahayana Tradition (FPMT) which has been teaching Buddhism in the West for several decades and has over 160 centers worldwide. Our community includes students who are young, middle-aged, old, married, single, and from all religious and ethnic backgrounds. 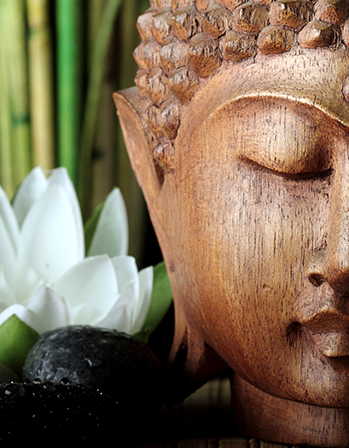 Most are attracted to Buddhism’s message of peace, compassion, and wisdom. We also attempt to foster a community atmosphere, where people can come when they need support during difficult times. We invite you to become a part of our Dharma family, or just drop in as you please! Following the advice of Lama Zopa Rinpoche, spiritual director of the FPMT, we present a variety of classes and events. We believe that a combination of study, practice, and ritual provide the optimal method for transforming our hearts, our minds into a positive force for kindness, compassion and wisdom. We provide an engaging selection of classes to suit all levels of interest and effort. Most importantly, we try to inspire students to take what they learn into their hearts and carry it into their everyday lives. At work, at home, in the community, even in traffic – we help students cultivate the tools for a happier lifestyle and a more peaceful environment. Thubten Kunga Ling was founded in 1994, under the spiritual direction of Lama Zopa Rinpoche, by Jacqueline Keeley. In the late 1980’s young Jacie was returning home from a long stay in India and Nepal where she had the fortune to meet and work for Lama Yeshe and Lama Zopa Rinpoche. Pretty soon Jacie saw the tremendous need people had to meet the Dharma to be able to cope with their complicated lives, so she started a meditation group and TKL was born. For many years, the group was composed of a core cluster of interested people, who met in public venues and at private homes. In late 1999, after an inspiring visit the previous year by Lama Zopa Rinpoche, enough strength was gathered to have our first home in Deerfield Beach. In May 2000 we were blessed when Rinpoche sent us Geshe Konchog Kyab who served for sixteen years as our resident teacher. Our current resident teacher, Venerable Lhundub Tendron, is an American nun who studied for 7 years with Gyumed Khensur Rinpoche Geshe Tashi Tsering and Geshe Jamyang while living at the FPMT’s Chenrezig Nuns’ Community in Australia. Welcome to Our Round Up of FPMT News in August!